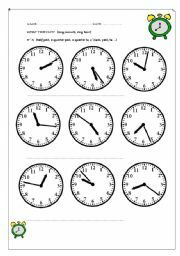 Good and basic worksheet to practice learning to tell time, by hour by half and by tens. 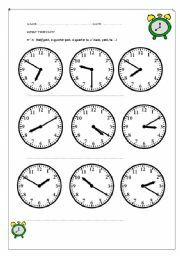 Good and basic worksheet to practice learning to tell time, any minute! 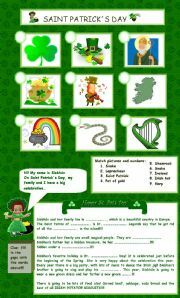 Matching reading and writing worksheet, just right for St.Patrick´s Day! It can be used with little ones (matching words and pictures) and older ones (fill in activity). Hope it´s useful. 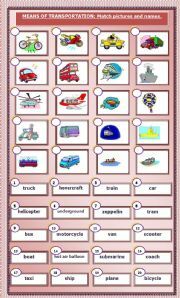 Elementary reading and writing activity that helps build skills in understanding names of modes of travel. Hope it´s useful. Reading - comprehension, multiple choice and role-play activity to review some common questions used when meeting someone for the first time. Hope it´s useful. 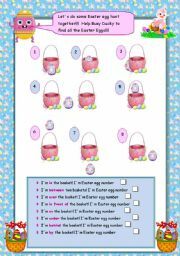 Help Busy Ducky to find all the Easter Eggs and practice prepositions at the same time with this two-page worksheet. Hope it´s useful. Have a good day! 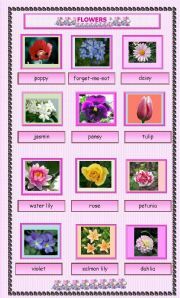 Plant identification: Students will become familiar with the names of these very common flowers. Luckily spring is coming and we´ll be able to take our students outside (playground or nearby field) and observe some of these! Elementary Easter pictionary. 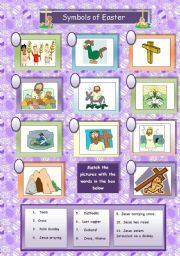 It helps little ones to identify the different Religious Easter symbols. Hope it´s useful. 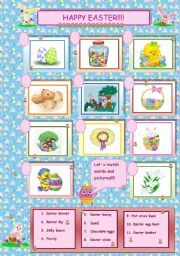 Elementary reading and writing Easter activity that helps build skills in understanding names of different Easter symbols. Hope it´s useful. This is one out of number of worksheets and little projects we are preparing for the "cultural diversity week - elimination of racism" which my school is going to celebrate next week, as part as end of the school year activities. 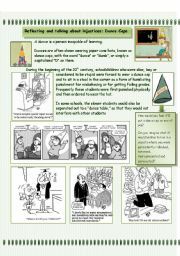 Hope you can use it with your students too. Good day!